Delos Museum erected at 1904 with the expense of the Athens Archaeological Society. The original building included the five western classrooms, plus several more in 1931 and 1972. In the same period have been huge, but unfortunate, changes in the appearance of the building. 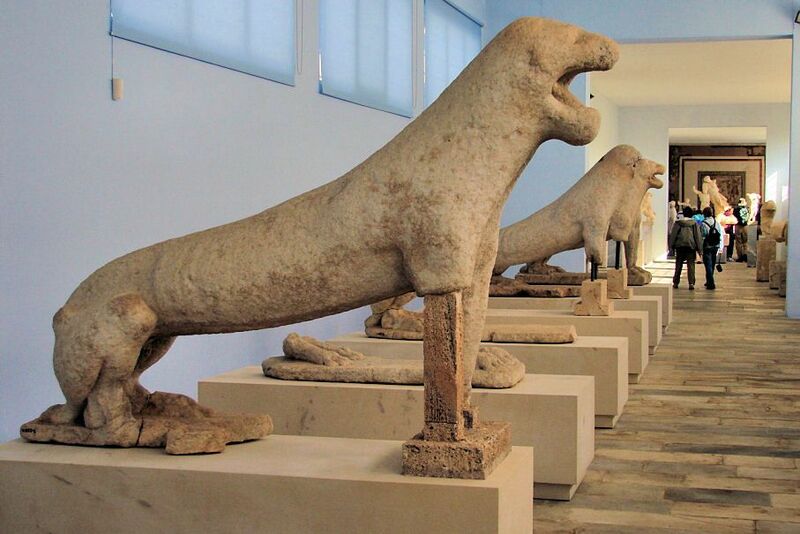 The present report contains nine galleries: in six of them out the sculptures and reliefs found on Delos, one of the best collections in the world. Two classrooms to include prehistoric pottery and ysteroellinistikon years and another out various miniature found in the private homes of Delos. The report is not yet complete. Key exhibits: plate with ivory relief of Mykinaiou warrior that was found in Artemision torso Kouros from the temple of Apollo, marble cluster Vorrea which snaps the princess of Attica Oreithyia and was the temple of Athens, statues Dioskouridi and his wife, Cleopatra — Athenians living in Delos – found at the home of the couple, in the area of theatre, statue of Apollo in the press of the Lyceum of Praxitelous Apollo – the god based in the trunk of a tree and clicks on Gallic shields – from the area of theatre, bronze facade bearded Dionysus who diadima bodies and ivy wreath and found south of the Market Kompetaliaston, Corinthian alabaster – a vase for perfumed oil with a Potnias Thiron between two swans – found in Iraio, headed triangular pedestal Kouros statue – with relief head crushed in a corner gorgoneia and the other two – from the Temple of Apollo, Archaic daughter – veil zosmeno bodies in the middle, which is decorated in the middle of the front with vertical film debossed double meandros – found from the Temple of Apollo and is considered one of the oldest existing large plastic, fresco from the outside wall of a house in the area where Skardana represented by Hercules, and two pygmachoi male form plays flute or trumpet. Tel 22890 to 22259, at the archaeological site of Delos. – Persons eligible for «free-pass» validate for three years, with the right of renewal. – Blind escorts and persons with disabilities.